We remember 26/11 for the reasons that tarnished us so deeply. Blessings to all the souls who departed and love and strength to their families and loved ones. But forget remberering we (majority people) do not even know that the Constitution of this Largest Democracy of the World was adopted on 26th November 1949 and got into force on 26th January 1950 which we celebrate as Republic Day. Why do we always have to shout for help when we are almost a second away from dying? To commemorate this day let’s remind ourselves who we truly are at least in this earthly space. Before and till end of cycle now, of being Indians or Americans or British or this or that, We are and shall remain Humans as we were named eons of cycles back in time. Then we became colored names, names of locations and finally landed in the vast cage of our man made ignorance and its more ignorant follies. Now how could we control this growing ignorant tribe. The only way to control was the fear of the unseen and fear of the unknown. And smartly enough we knew what that was. HE was called God. The shoulders on whom we could place our weapons of ignorance and ego and lash out at who we wanted to and of course when we wanted to. And we the smartly foolish ones, thought – how will it ever matter to this unseen and unknown HE what we did because as per our convenient thinking HE didn’t exist. So then started the smart but actually ignorant game of Eternal Blame. ¿ When we achieved something We were awesome and great. But when we didn’t; Why does God be so unfair to me? ¿ When we had the most fairytale romance We deserved it because such wonderful people we are. But when it’s all tai-tai-phish (term for over and out); God why are you punishing me like this? ¿ When we are healthy and happy we never seem to remember HIM. But when we are going through a seeming issue we are rattling 100 times a day – Why me God? Which in sublime terms would mean why not anyone else. – Taking for granted became our Birthright. Whether that be people, things, life or the dear God Himself. – Intolerance by our own terms became the optimum threshold of world tolerance. It’s the famous “my way or the hell-way” (Yes Highway has been replaced years back). – Our motor responses are totally out of sync as we have forgotten to speak or do what we truly think or want to do. We say something, do something else and most times mean or think neither of it. – Herd mentality has been the newest fashion fad. We always want to follow a mass thought process and give our two pence sage advice in everything. Again most times which is out of sync of what We truly mean or say.. thereby contributing to the collective consciousness and Karma of more mayhem. This can go on. But we need to cut short this nightmare of illusion if we want to wake up to the dawn of awareness. Please if you even for a second truly wish that the World be a better place for all of us, we need to first be the Best for the World. We need to live life as if carrying a plot of land every breath that’s called NOW and living in full awareness of the seeds we are sowing. So that we don’t have to jump up and scream “where did this come from when we find ourselves in the thick of the Cactus.” Apple gives Apple Juice and Orange gives Orange. Until we even turn that around, hopefully it shall remain that way. Let all of us individually and collectively only exercise kindness, love, tolerance, compassion and oneness in all that we think, speak or do. Let us pledge to no one but ourselves that we shall do our best to Live these qualities irrespective to other people’s opinions of how idealistic or too good to be true it may sound. 1. 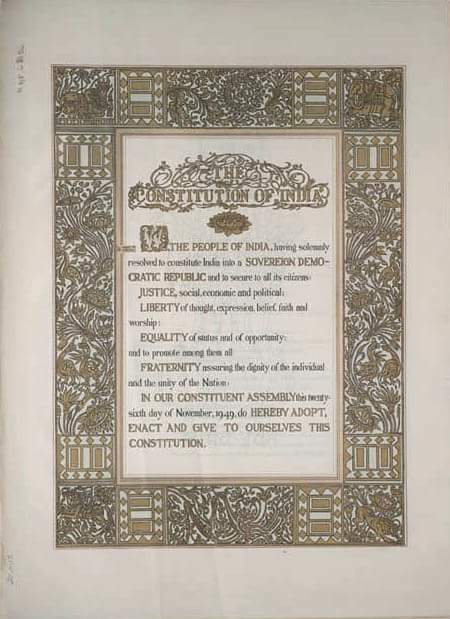 It mentions that the Constitution derives its Authority from the people of India. 2. It declares India to be sovereign, socialist, secular, democratic and republic country. 3. It clarifies the objectives of the Constitution are Justice, Liberty, Equality and Fraternity. In the meantime atleast be a human indian and Let us read the Pledge once again that we spoke shouting our lungs out in the school assembly hall. “India is my country and all Indians are my brothers and sisters. I love my country and I am proud of its rich and varied heritage. I shall always strive to be worthy of it.